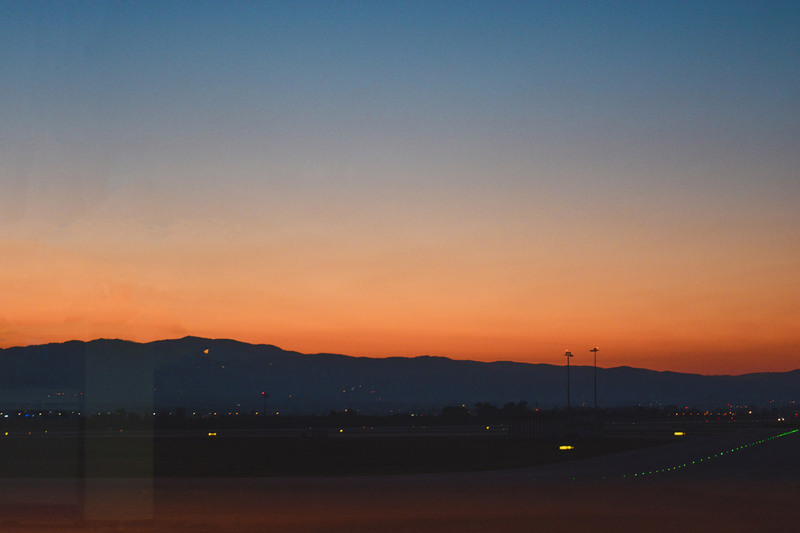 It took us quite a lot of hours to travel the 1710 miles that distance Lisbon and Sofia… Thankfully our Lufthansa flights were comfortable, on time and it’s always nice to have some free food on board. Yes, even if it’s just some poorly-filled sandwiches. We used our long layover in Frankfurt to explore the city beyond the airport. e were so tired when we got to Sofia that we took a taxi at the airport. They are quite inexpensive in the country, but make sure to catch the right ones so you aren’t scammed. The first night we didn’t even have dinner, and totally crashed at our hotel. We opted to stay at the St. George Hotel and we recommend it. The location is as central as it gets, and the rooms are comfortable and spacious. 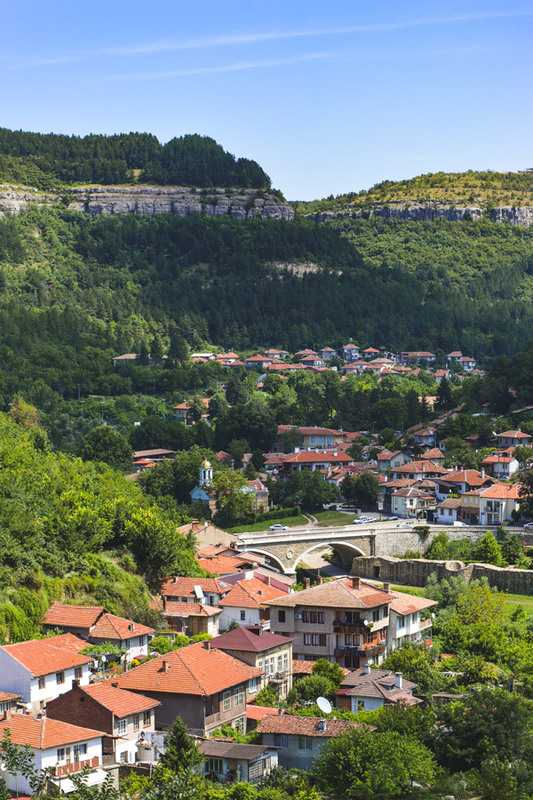 Though it may not be considered a budget option in Bulgaria, it is quite affordable. Our first proper day in Bulgaria was spent in Sofia, exploring the main sites. 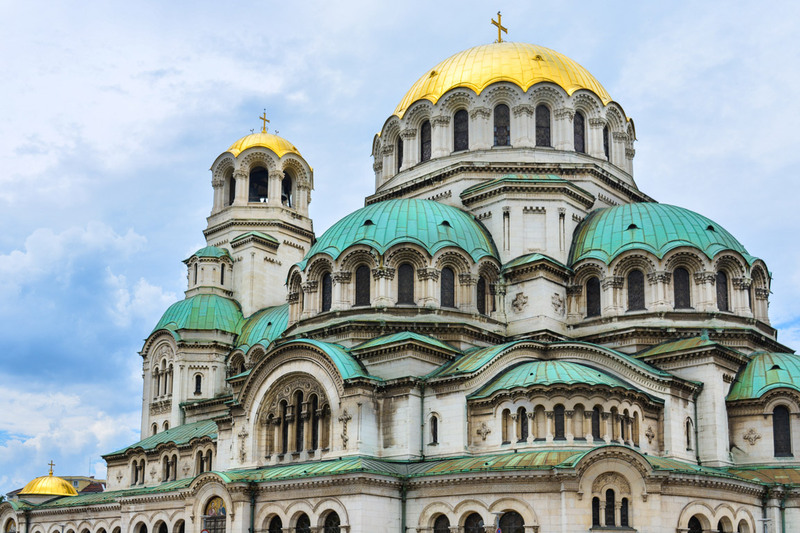 There are some landmarks you just can’t miss when you visit Sofia, such as Alexander Nevski Cathedral and the area around Serdika. 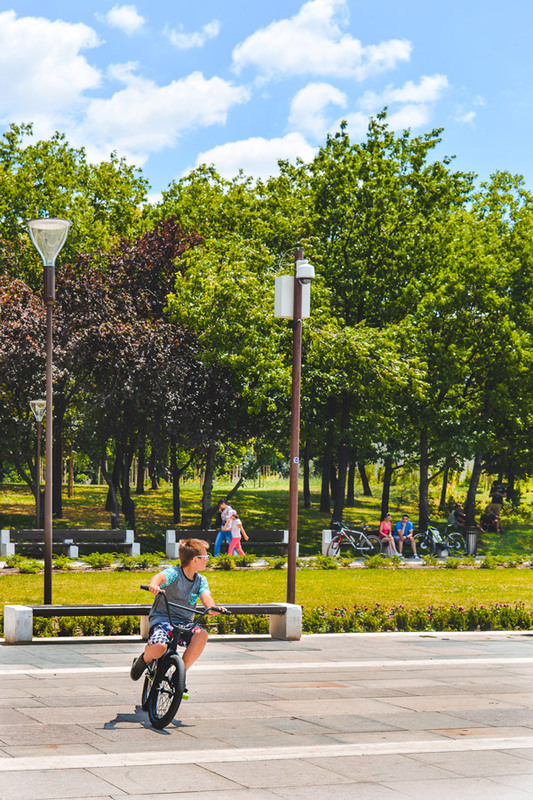 Vitosha, the main street, is filled with people and wonderful cafes. 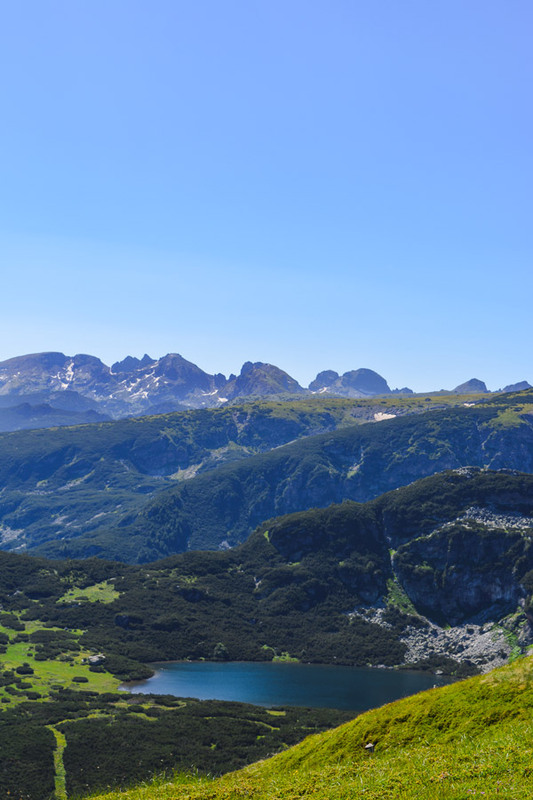 While walking you can also appreciate a view to the nearby mountain of the same name. The weather app incorrectly forecasted a cold rainy day. The day was mostly sunny except for a few thunderstorms. It was actually really warm, as it would be for the rest of our trip. Day 2 was mostly a travel day. We went back to the airport, this time using the recent and super efficient metro system. Burgas, on the coast of the Black Sea, was our flight destination. At home we struggled a lot whether to go by plane or by bus, and ended up deciding on the first because it was faster. In the end, it was not! Our Bulgaria Air flight was delayed, and we were stopped in Varna for hours before actually flying to Burgas. To make things worse, we spent about an hour in a line for document verification and another on a taxi to our resort in Aheloy. It wasn’t all bad, though. We got some free chocolate on the plane! Plus, we were ready to enjoy somedays by the seaside. Besides exploring, we really needed to rest, so we decided to spend three nights in the Vineyards Hotel. The reality was that we only had a day of proper rest, the Day 3 of our trip. It was spent lounging by the pool and dreaming of parlenka (traditional and delicious Bulgarian flat bread). The resort had a lot of potential, but it was not the semi-luxurious experience we were expecting. 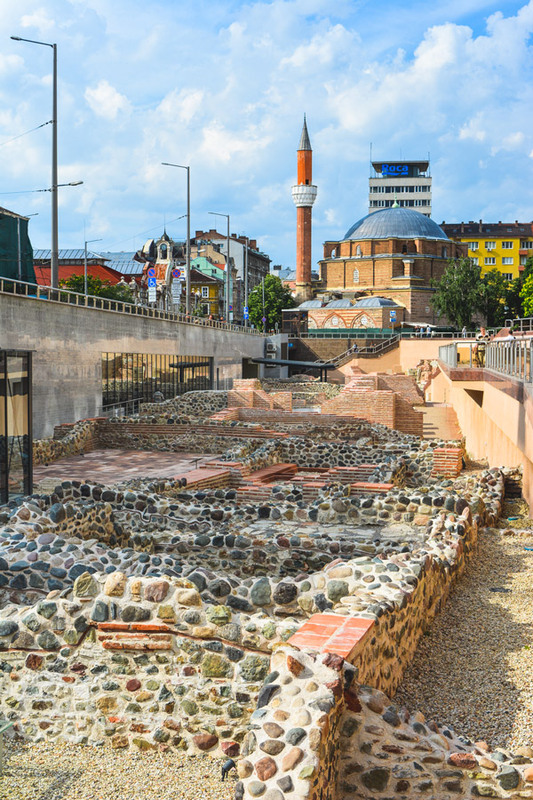 You will probably find better options for when you visit Bulgaria. We found a few problems: it was hard to get information about places nearby, and the Hotel was absolutely in the middle of nowhere. It was also quite expensive as we decided to splurge on the Executive Suite, and considering all the related transportation costs. The Executive Suite was indeed bigger than our house. There were other perks, such as a pool you only shared with the other five suites. However, looking back, we probably should have opted for a more affordable room: the normal hotel pool was quite nice and never full. One of the reasons we opted to stay in Aheloy was its close proximity to Nessebar, the pearl of the Black Sea. Despite the public transportation hurdles, we visited on the 4th day of our trip. Yes, it is a bit of a tourist trap and (at least) in the Summer the main street is completely filled with tourists. Nonetheless, if you get off the main grid you can have a wonderful side street all to yourself. The town is absolutely lovely and has a lot to explore: its architecture is very unique and the amount of churches seems infinite. Plus the seafood is great, very affordable, and amazing views of the Black Sea are abundant. Day 5 was all about getting to Veliko Tarnovo. We used Alex Ok to get there and were pretty satisfied with the service. The bus ride was one of the most beautiful we’ve ever been on, with scenic views of mountains and sunflower fields. 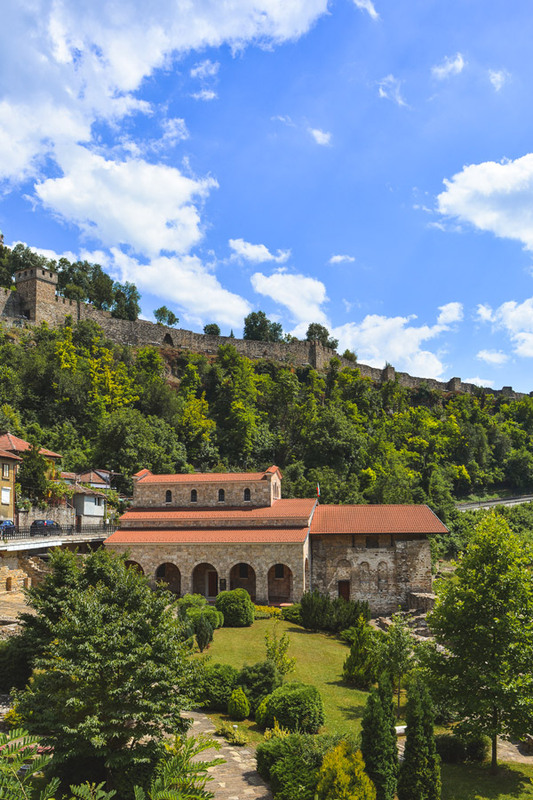 Once you start getting closer to Veliko Tarnovo the views fill with green and indeed, the city itself is one of the greenest cities we’ve seen, surrounded by hills. We opted to stay two nights at the Hostel Mostel, very famous among backpackers. The hostel was comfortable, well located, and very much what our budget needed after our time in Aheloy. 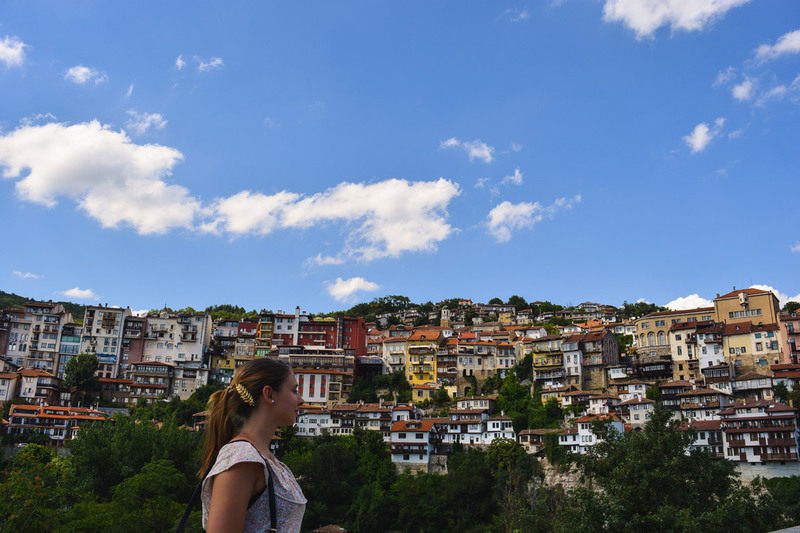 We only spent a full day in Veliko Tarnovo: it was enough to explore the main sites, but we would have loved to spend more time in the city (it is as beautiful as it is peaceful). 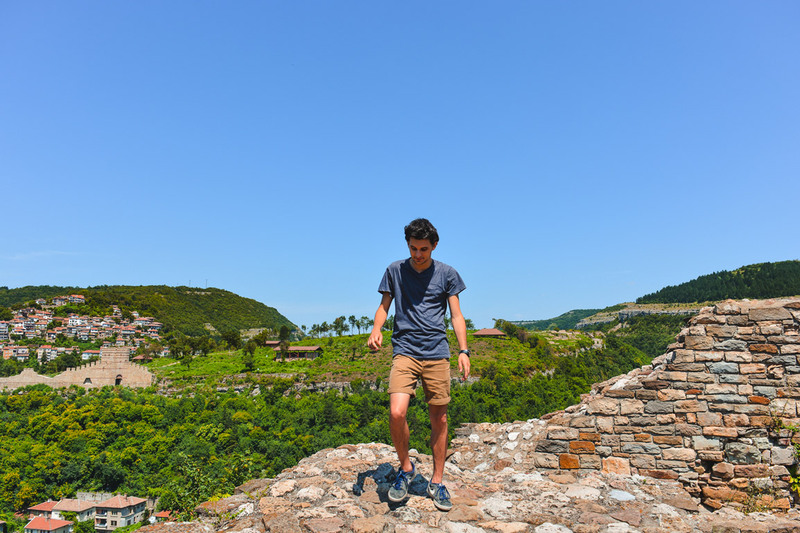 I think we could have spent a week exploring the Tsarevets Fortress (mostly pretending we were on Game of Thrones). 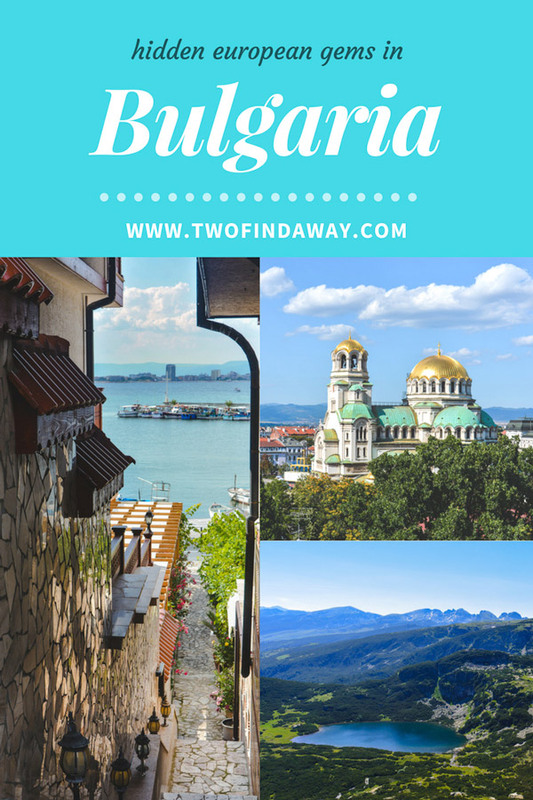 This is a place you absolutely should add to your Bulgaria itinerary, and one of our favorite parts of the trip. 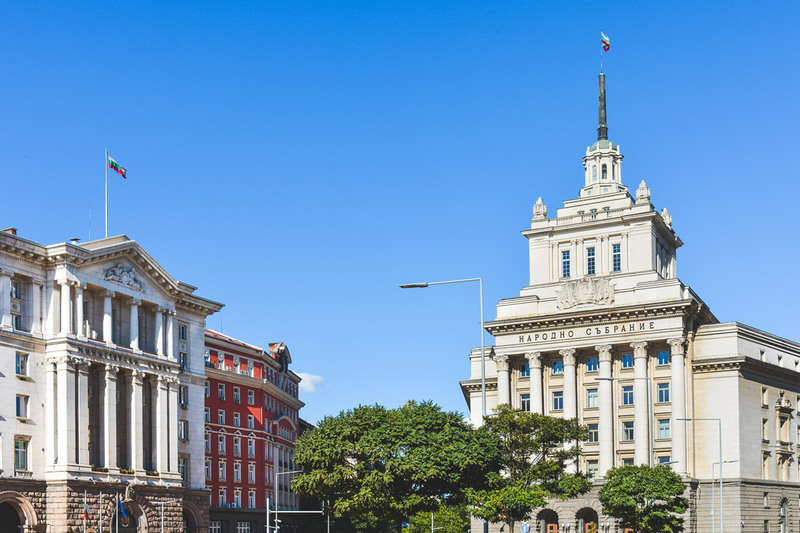 After one full day in the city, we woke up the next morning to catch our bus to Sofia and we enjoyed a sunny afternoon in the capital. We used Biomet, and even though the bus was a bit delayed, it was very comfortable and modern. 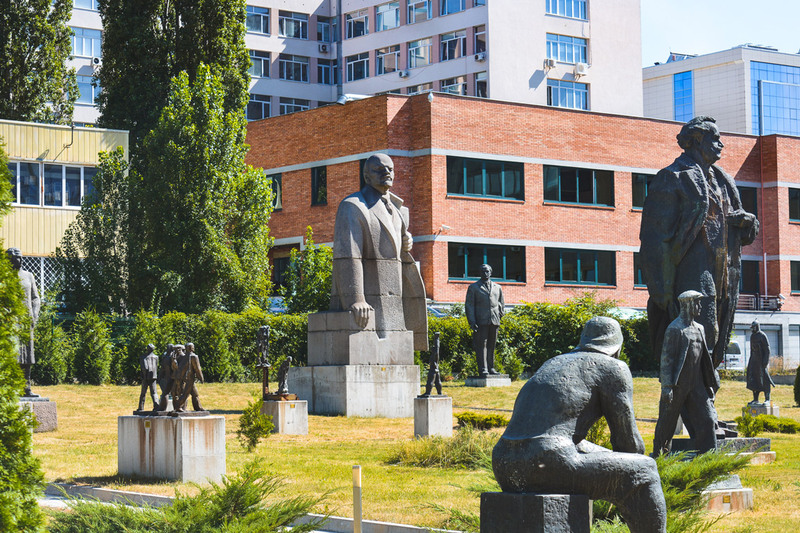 Day 8 was spent in Sofia, most of it specifically at the Museum of Socialist Art (from our experience it goes by different names). It is an absolute must see for all its weirdness. Surprisingly, we were the only ones there. It is great if you love history and museums, but equally great if you don’t, as it’s certainly not your typical museum. Maybe it’s better described as a gallery of not-so-faraway times. Day 9 was certainly the most breathtaking (both literally and figuratively) of our trip. 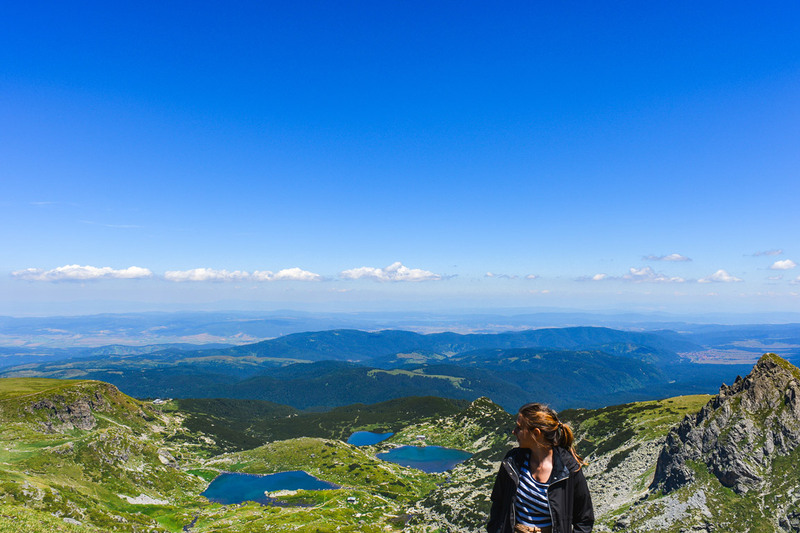 It was all about hiking the Rila mountains to view the amazingly beautiful Seven Rila Lakes. 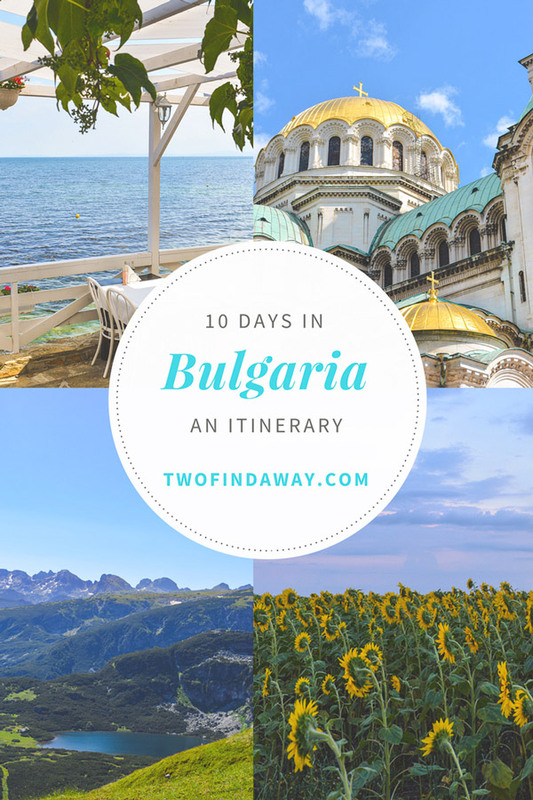 This was the one thing we knew we absolutely didn’t want to miss on our Bulgaria itinerary. 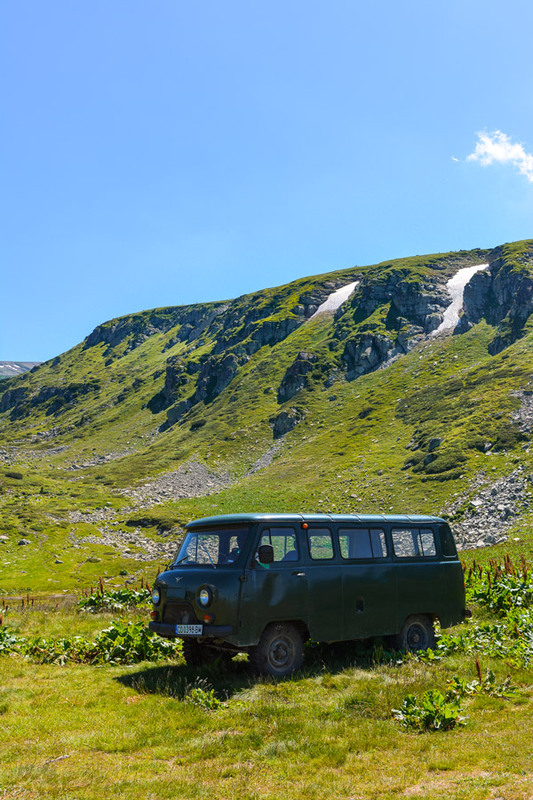 Unfortunately, it can be tricky to get there using public transportation, but we were very satisfied with the service provided by the Rila Shuttle: we got a comfortable ride to the beginning of the trek and back to Sofia for a reasonable price. We wanted to hike without a guide, so it was the perfect option for us. This was an experience we’ll certainly never forget! It was the first time we felt the full effects of high altitude and our first proper mountain adventure: we’re aware it was actually not that adventurous but we really had an amazing time and up in the top (where very few people climbed to) we felt like true explorers. Needless to say we woke up completely wiped and sunburnt the next day. 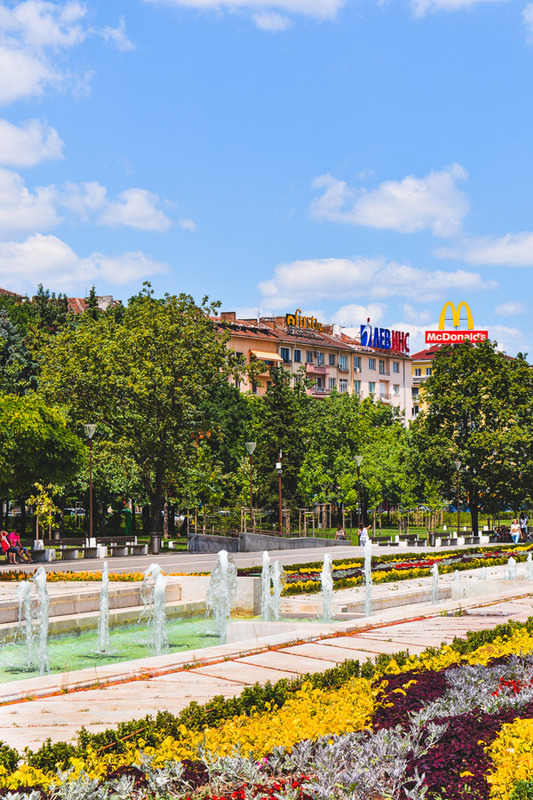 However, it was our last one in Bulgaria so we got moving to explore a bit more of the city. 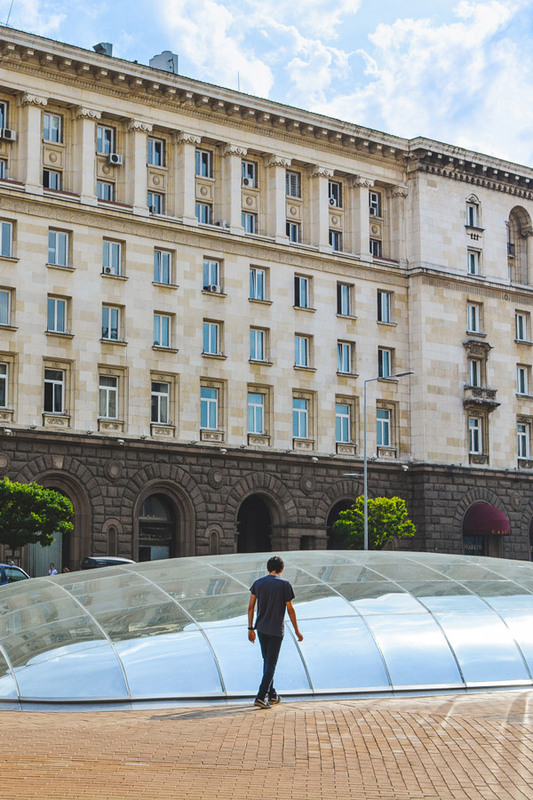 We ended up spending most of our day at the National Palace of Culture (NDK) and enjoying the rooftop views from the Sense Hotel Sofia. As our flight the next day was very early in the morning we opted to stay at the Ibis Sofia Airport, which offers free transfers to the airport. Once there we were treated to a magical sunrise over the mountains. The photos don’t do it justice (they never do!). 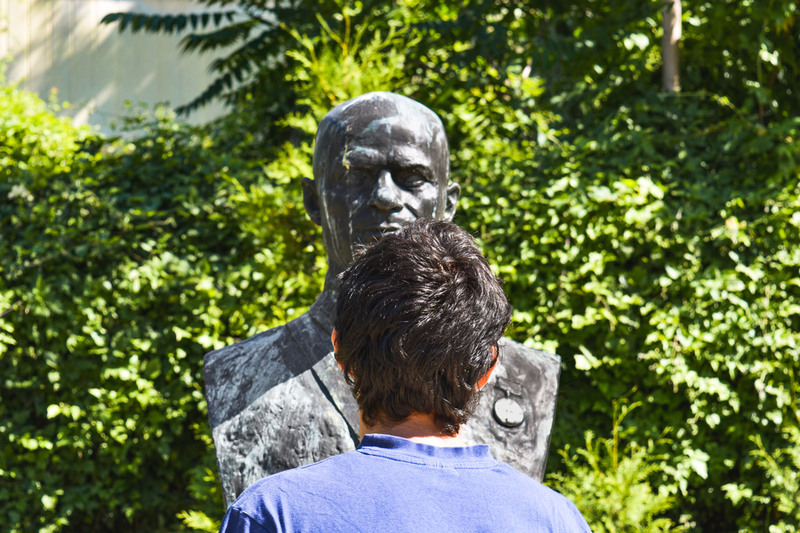 It was surprising how easy it actually was to travel around Bulgaria. We planned everything ahead of time, and bought all our tickets online, and had no issues with public transportation. There were some delays, but nothing different from what we are used here in Portugal. 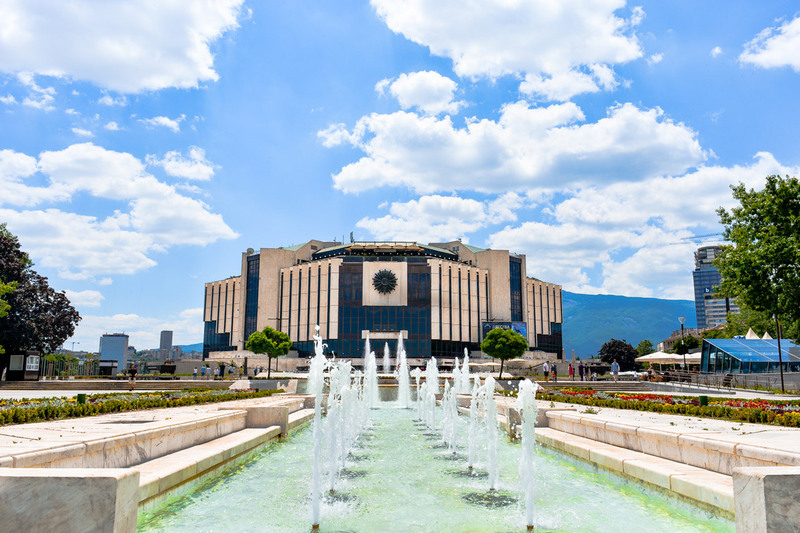 If we were to plan a Bulgaria itinerary with all the new information there are only 2 things we would consider changing. To start, we would get to the coast by bus or train. When there, we would probably choose a more central hotel. Being in the middle of nowhere in Aheloy was peaceful, but it was a very expensive part of our trip. 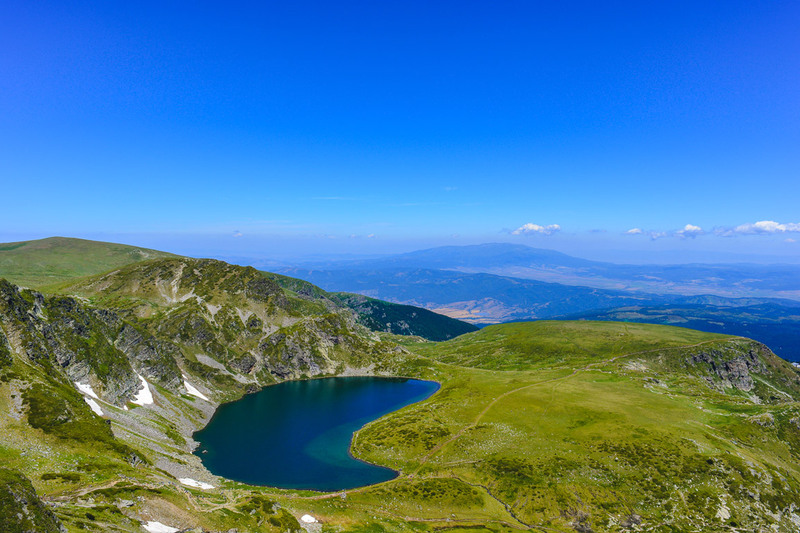 You will notice some famous sites missing from our itinerary: Vitosha Mountain, Plovdiv, Rila Monastery and the Buzludzha monument – just to name a few! 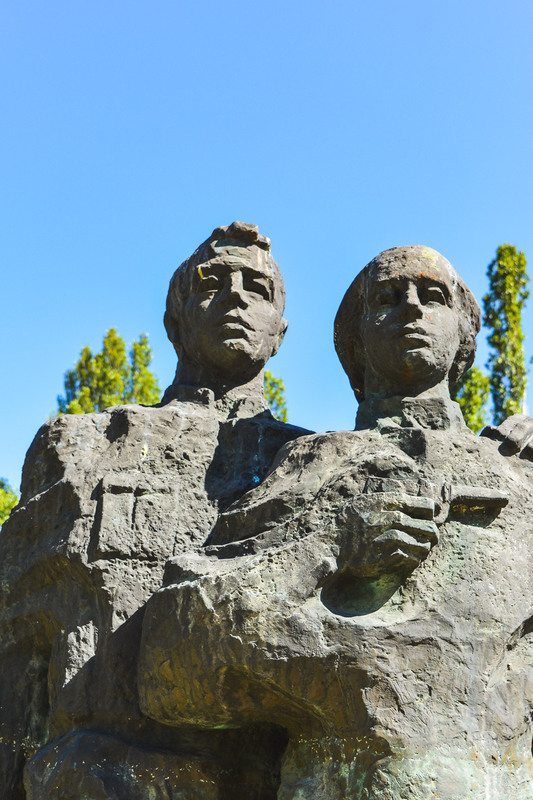 Unfortunately we were not able to fit them into our itinerary, but they are certainly on our list of top priorities once we return to Bulgaria. And we are certain we will return! What about you? 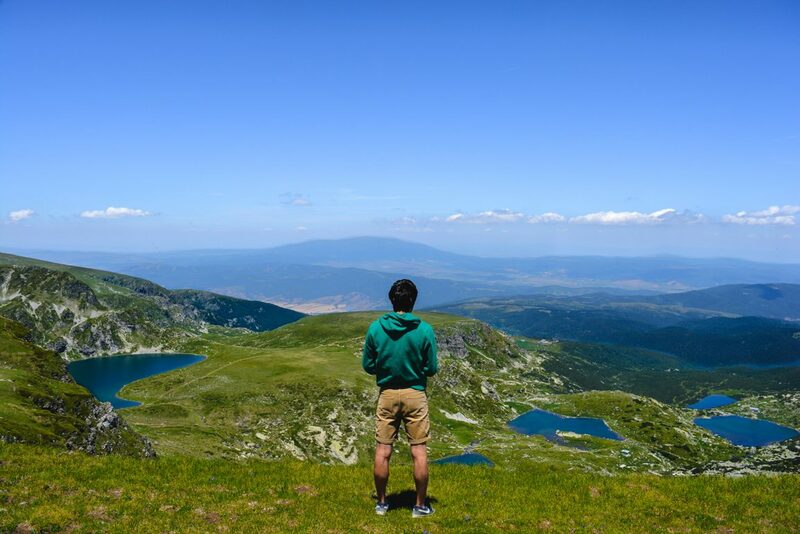 Have you ever visited Bulgaria? How did you spend your days there?